In 1924, Sun Yat-sen, pioneer of China's democratic revolution and the founder of the Kuomintang (KMT), worked together with the Communist Party of China to organize workers and peasants for the Northern Expedition (historically known as the Great Revolution). After Sun Yat-sen passed away, the right-wing clique of the KMT headed by Chiang Kai-shek staged a counter-revolutionary coup d'etat in 1927, murdering Communists and revolutionary people, and founded the Kuomintang regime in Nanjing. Thus the Great Revolution ended in failure. After that, the CPC led the Chinese people to wage the 10-year Agrarian Revolution War against the reactionary rule of the Kuomintang, which is also known as the "10-Year Civil War." From June 1946, the Kuomintang armies launched an all-round attack on the Liberated Areas led by the CPC, and an unprecedented large-scale civil war started. To thoroughly emancipate the Chinese people, the CPC led the army and people in the Liberated Areas to start the nationwide War of Liberation. Through the Liaoxi-Shenyang, Huai-Hai and Beiping-Tianjin campaigns, the CPC overthrew the rule of the Kuomintang and won a great victory in the new democratic revolution in 1949. From September 21 to 30, 1949, the First Plenum of the Chinese People's Political Consultative Conference (CPPCC) was held in Beijing, with the participation of various political parties, popular organizations, non-Party democrats and representatives from all walks of life. 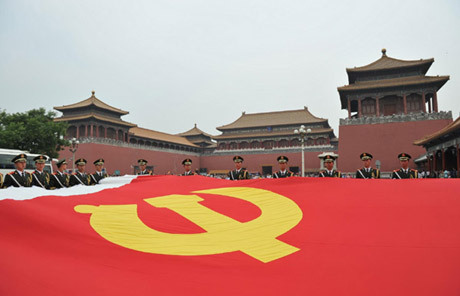 The CPPCC drew up a Common Program, which served as a provisional constitution. It elected a Central People's Government Council, with Mao Zedong as Chairman, and appointed Zhou Enlai Premier of the Government Administration Council and concurrently Minister of Foreign Affairs. On October 1, 1949, a grand ceremony inaugurating the People's Republic of China was witnessed by 300,000 people in Beijing's Tiananmen Square. On that day, Chairman Mao Zedong solemnly proclaimed the formal establishment of the People's Republic of China. The 10 years from 1957 to the beginning of the "cultural revolution" in 1966 was the period in which China started large-scale socialist construction. The nation's total industrial fixed assets quadrupled between 1956 and 1966, and the national income increased by 58 percent in terms of constant prices. The output of essential industrial products increased several-fold, even over tenfold. A group of new and developing industries were founded, and large-scale agricultural capital construction and technological transformation unfolded on a large scale. Both the number of tractors used in agriculture and the volume of chemical fertilizer increased by more than 600 percent. The 12-Year Plan for Scientific and Technological Development (1956-1967) was completed five years ahead of schedule. Outstanding achievements were recorded in many new fields of science and technology. The "Cultural Revolution," which lasted for 10 years from May 1966 to October 1976, was initiated and led by Mao Zedong, the then chairman of the CPC Central Committee. Taking advantage of Mao Zedong's mistakes in his later years, the Lin Biao and Jiang Qing counter-revolutionary cliques, unbeknownst to Mao, engaged in activities that brought great calamity to the country and people, causing the most serious setbacks and most damaging losses to the country since the founding of the People's Republic of China. In spite of the grievous mistakes Mao Zedong made during the "Cultural Revolution," his lifetime record shows that his contributions to the Chinese revolution far outweighed his errors. Drawing on the support of the broad masses of the Chinese people, the CPC smashed the Jiang Qing clique in October 1976. A new era of development unfolded in Chinese history. In July 1977, responding to the fervent demands of all the people, the CPC reinstated Deng Xiao-ping in all the Party and government posts he had been dismissed from during the "Cultural Revolution." The Third Plenary Session of the CPC 11th Central Committee held at the end of 1978 represented a great turning point of profound significance in the history of New China. Since 1979, China has pursued a policy of reform and opening to the outside world, a policy which was initiated by Deng Xiaoping. Major efforts have been made to readjust the economic structure, and reform the economic and political systems. China is, step by step, establishing a road with Chinese characteristics, a road that will lead to socialist modernization. Great changes have come about in China since 1979. The situation in the country is the best ever, and the people are enjoying more material benefits than ever before. Jiang Zeming, since taking office as the General Secretary of the Central Committee of the CPC, Chairman of the Military Committee of the CPC and the President of the People's Republic of China, is leading the third generation of the leading body to carry out Deng Xiaoping's theory, persist in and continue the policies and principles of reform and opening to the outside world advocated by Deng Xiaoping, making the country stable, economy developed and foreign relations promoted and winning the support from the people. In 2002, Hu Jintao became the General Secretary of CPC. Except for going on with the economic reform, he pushed forward the Scientific Outlook on Development which did boost the economy. What's more, central leaders paid more attention on people's livelihood and advocated building harmonious society. At the same time, China's international influence had a significant upgrade, especially by holding the Beijing Olympic Game, Shanghai World Expo, etc.